Hanoi is the capital of Vietnam with a population of 6.2 million (including suburb areas, as of 2007). As shown by its description in Chinese, "河内" or "River Inside," the city is located in the delta of the Red River, which flows through the northern part of Vietnam. The city is developing quickly and, at the same time, facing various types of problems related to urbanization, such as water environment pollution, poor sanitary conditions, waste disposal issues, air pollution, flooding, and traffic jams. The Hanoi University of Science and Technology (HUST) was founded in 1956 as the first national technical college in Vietnam and is located at the southern part of Hanoi. It consists of 14 faculties, seven research institutes and 18 centers, and has a high reputation as one of the leading universities in Vietnam that offers almost all fields of science and engineering. About 1,650 faculty members educate 40,000 undergraduate students and 2,000 graduate students. 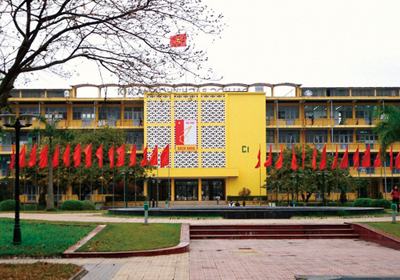 The university has a high reputation particularly in the engineering fields, and actively conducts research activities in addition to providing advanced education. In December 2008, the Graduate School of Engineering, Graduate School of Global Environmental Studies, Graduate School of Energy Science and Graduate School of Informatics of Kyoto University, and the Hanoi Advanced School of Science and Technology, Institute of Environmental Science and Technology, Faculty of Information Technology and Institute of Heat Engineering and Refrigeration of the Hanoi University of Science and Technology established the Kyoto University-Hanoi University of Science and Technology Research and Education Program on Environment Studies. This program is the base of our GCOE program in Hanoi. The Hanoi base has an office and a laboratory in the Institute of Environmental Science and Technology and is preparing equipment that will allow for basic analyses and experiments. Two faculty members from Kyoto University and a few local staff are stationed at this base. The base has already received students from Kyoto University through the internship program, and is currently conducting research from such various standpoints as aquatic environment, urban sanitation, waste, the atmosphere, architecture, climate change and disaster prevention, environmental governance and resident participatory environmental improvement using Hanoi and its periphery as research fields. These schools of Kyoto University also have agreements for research cooperation with the Vietnamese Academy of Science and Technology Institute of Environmental Technology and the Hanoi University of Civil Engineering, both located in Hanoi, through which the base plans to conduct aggressive research activities as a base in cooperation with these universities and/or other related universities and organizations.